As we launch our newest Hands On project in Colombia, here are six things you need to know about the life-changing work you can support. So far we've successfully completed three Hands On projects in Kenya, Bolivia and Niger. Our first project restored a dam and reservoir in Kitui, Kenya that brought water back to the community. Our second and third projects in Doutchi, Niger and the Atliplano, Bolivia ensured that families were able to grow and have enough food to feed their families, especially in difficult times such as droughts and floods. Our fourth Hands On project has now begun in Colombia, where a team of young people need your help to bring peace back to their community. Each Hands On community we work with face multiple and complex challenges, so significant change takes years to achieve. Every Hands On project runs for either two or three years, which means we can plan projects that have a lasting impact. We invite supporters to get hands on throughout the whole project period. Our fourth project in Colombia will last three years. Our next innovative project is based in the Magdalena Medio region of Colombia – a region that has witnessed decades of conflict. 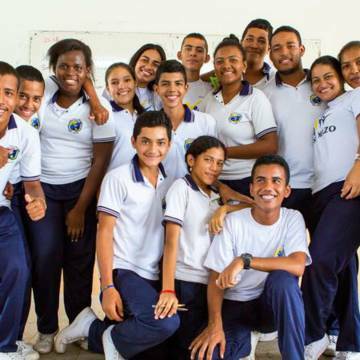 Not one person in the community has been untouched by the violence - Rosana lost her uncle, teenager Sebastian was recruited by an armed group, and teacher Eligio received death threats. This new three-year project will work with a team of young people to repair and heal their community. Our Hands On communities need constant financial and technical support over a number of years, so we are inviting you to donate every month, by Direct Debit, to your Hands On project. When the two or three years are up and your project ends, we’ll introduce you to another project and once again you can follow the work from start to completion. If you are unable to continue supporting Hands On, you can change, pause, stop or restart your donations at any time. Every penny you donate goes into our Hands On Fund and your project will receive all the money it needs from the fund. Should we raise more than we need for your specific project, any extra donations in the Hands On Fund can be used to support another community with a similar project to transform their lives. Over time, the Hands On Fund will support many projects, but you’ll always be able to see how you are helping communities to build a secure and prosperous future. Every Hands On supporter receives three Hands On updates in the post each year, along with our supporter magazine Side by Side. You can also choose to sign up to regular email updates for extra news and videos.